Israel :: "Jerusalem of Gold"
For the majority of Jewish people, the holy city of Jerusalem stands as the symbolic center of Judaic culture and faith. 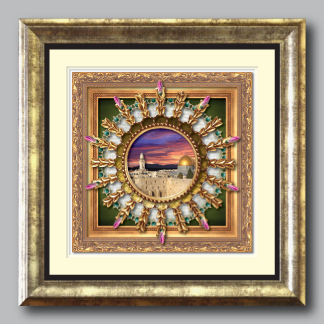 This art piece takes its inspiration from this ancient city, and from the song “Jerusalem of Gold”. 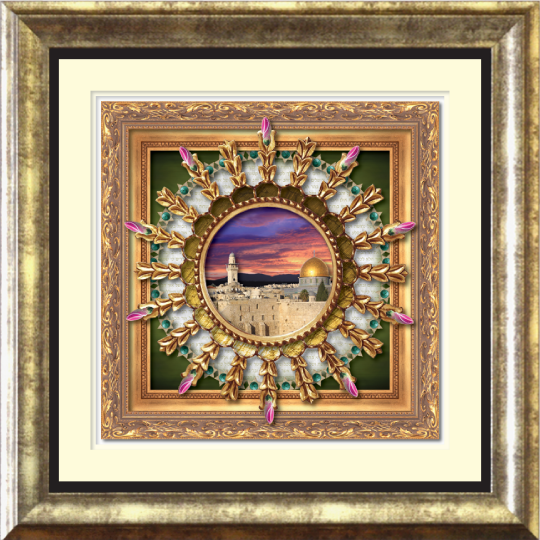 The central image of this design features a dramatic view of the Western Wall in the Old City of Jerusalem. This location is the spiritual epicenter of Jews the world over. A vividly dramatic and colorful sky is depicted as the sun sets behind the mountains in the distance. 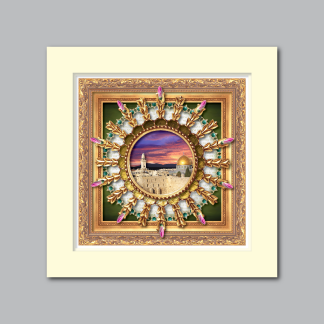 Surrounding this image is an ornate circular ring that radiates with golden spokes reminiscent of sprouting plants. These spokes terminate with pink buds of Cyclamen, the national flower of Israel. They represent the growth and evolution of the country of Israel. Each individual bud represents the potential bloom that is yet to come. Behind this crown of gold is a field of white marble stones. Scribed on this tablet are the Hebrew words from the song “Jerusalem of Gold”. This beautiful and heartfelt song has captured the hearts and minds of Israelis and Jews all over the world. Encircling the marble tablet is a ring of Mogen Davids, or Stars of David. Each star holds in its center a blue green Eilat Stone. These lovely gemstones originate from the city which bears their name, located in the very southern part of Israel, just north of the Red Sea. The back layer of this design is a background of deep olive green representing the vast variety of agricultural offerings born from the love , labor and cultivation of the sands of the desert.